There is nothing that I love more than a good oatmeal raisin cookie. Yes, I know, I don’t have many cookie recipes on the blog, but there’s a reason for that. If I had mostly cookie recipes on this blog, my blog probably wouldn’t be called “The Sophisticated Gourmet.” The blog would probably be called “The Cookie Monster Gourmet.” And we don’t want that, do we? Of course not! Anyway, oatmeal raisin cookies are great for just about any time of the day; except for lunch and dinner- that’s when popcorn comes in. Just kidding! I promise! Maybe. 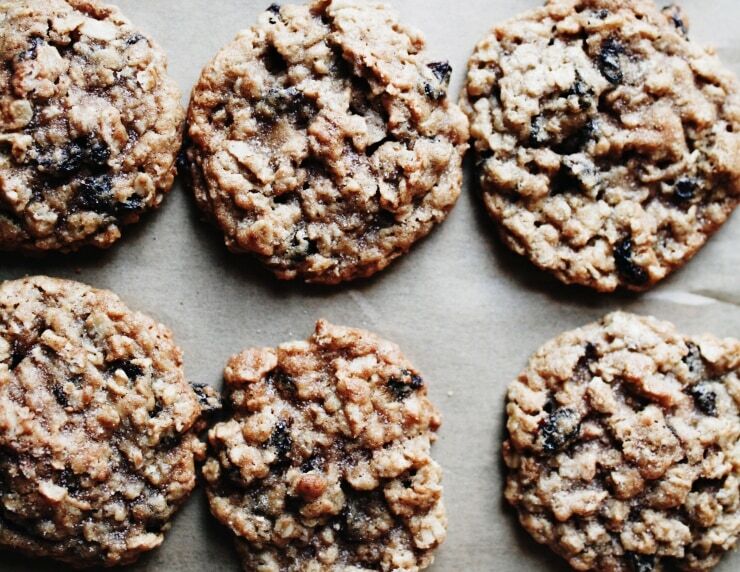 One of my ultimate favorite cookies are oatmeal raisin cookies. They are just amazing! I woke up two days ago, psyched that I had the house to myself for a couple hours, just so I could bake and take photos. Oh, how pleasant it was! Oh, this recipe that I’m going to share with you will have you jumping in your pants! Why? Well, the best thing about this recipe, is that is super yummalicious, and it’s super versatile. For example, if you think that raisins remind you of “dead”, ugly, and decrepit grapes (or if you just don’t like raisins because of their taste), you can omit the raisins in these oatmeal raisin cookies. Omitting the raisins allows you to add your own mix on things… You can make oatmeal craisin cookies, just plain ‘ol oatmeal cookies, oatmeal raisin and walnut cookies, oatmeal chocolate chip cookies… You should understand what I mean by now- there are endless possibilities for this recipe (and I bet there are for other great oatmeal cookie recipes out there, as well). This recipe is super simple to make and to make these even more awesome, sprinkle some cinnamon sugar on top of them, right after they come out of the oven. 4. Sift flour, baking soda, cinnamon, and salt. Then mix into the mixture of creamed ingredients. 5. Stir in the oats and the raisins. Mix well. 6. Chill the dough for a few hours. 8. Bake the cookies for 10 to 13 minutes, or until they are golden brown. 9. After the cookies come straight out of the oven, top them with the cinnamon sugar. 10. Cool the cookies for 1 minute on the cookie sheet and proceed to move the cookies to a wire rack to cool. This is where I break rules, sometimes. I sometimes give into temptation and sneak a couple of cookies. For testing purposes… Maybe not, but we have to give into temptation once in a while, right? Can I add a handful of pecans and choc chisp to the dough. Hi Fawzia- Yes, most definitely! Those would be great additions. Hi Kamran, love your book! I was baking these cookies and they taste fabulous! However they’re not really chewy. Yours look flat whereas mine are rounder. After dropping the round tablespoon portions, should I flatten them? I’m guessing not but ….. Thanks :).